We want your help to select this year's Congress Choice Award winner! Voting is now open and closes Thursday, March 29 at 7:00 PM. We'll announce the winner during the Urbanism Awards on Thursday, March 29 from 5:30 - 8 PM at Impact Hub, Boston, MA. DESCRIPTION: PlanBTV Walk/Bike is Burlington’s first comprehensive plan for active transport. The 10-year plan was initiated in April of 2015 and unanimously adopted by Burlington’s City Council in March 2017. 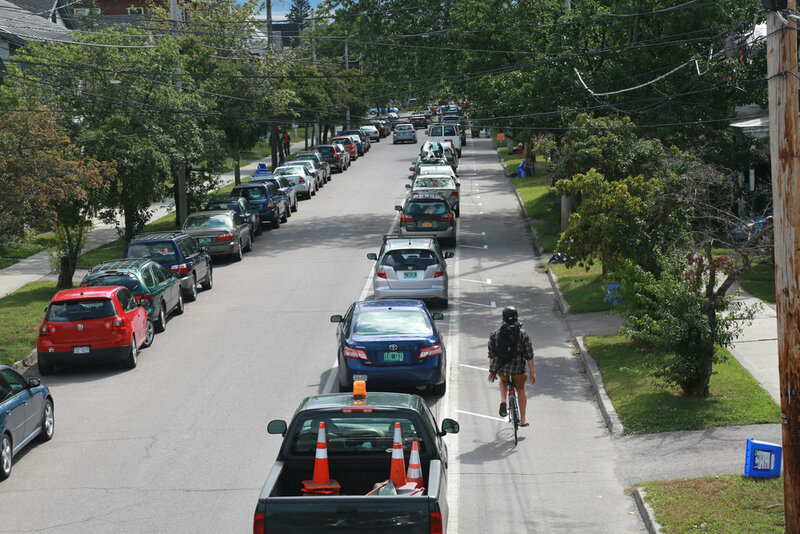 With limited resources but a robust citizen advocacy sector, the plan is pragmatically based on a single guiding principle: collaborative action to make Burlington the most bike and pedestrian-friendly small city on the east coast. In 2016, Mayor Jim Donchess tasked city staff to begin a conversation around how the City could enhance the quality of life for the community and maximize economic and environmental value of the downtown riverfront area. 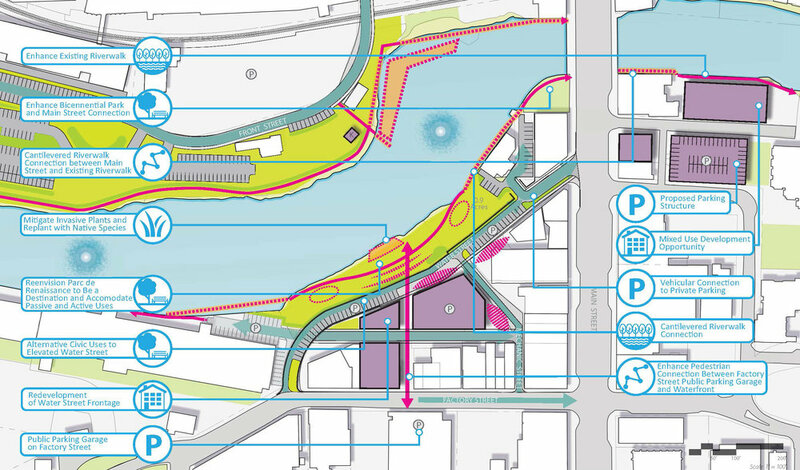 A Downtown Riverfront Master Plan project was initiated to capture the community’s vision for the riverfront along the Nashua River. The resulting plan, based on public conversations both in person and online, incorporates an understanding of environmental constraints, existing conditions, and a desire to preserve the uniquely rich Nashua history of the Millyard with the community’s desire for improved and expanded connectivity, riverfront amenities, green space and appropriate redevelopment within the Downtown area. The Green and Complete Streets Initiative is the northeast’s first Green and Complete Streets policy enacted as an ordinance. The purpose of this ordinance is to require public capital projects and private developments to incorporate complete streets principles (ADA, bicycle infrastructure, safe crossings, etc.) and green infrastructure (trees and bioswales) into their projects. Additionally, the ordinance requires the city to track progress on the initiative through 15 metrics and consider these metrics when developing capital plans. The ordinance takes effect July 1, 2018. A transit-oriented development located at the prominent terminus of the Rose F. Kennedy Greenway in the Bulfinch Triangle, the nearly 450,000 GSF One Canal includes 310 residential units and 21,000 GSF of retail space. Construction of the nearly $150M development was completed in July of 2016. With the overall purpose of reknitting the grids of the North and West Ends after the Central Artery’s removal, One Canal’s volumes turn to address each neighborhood, with massing and textures responding to the historic Bulfinch Triangle context of individual buildings aggregated over time. The Town of Ridgefield is currently working with the Western Connecticut Council of Governments (WestCOG, formerly Housatonic Valley Council of Elected Officials) to develop a Transit Oriented Development Plan for the Branchville Station Area. The goal of this effort is to identify measures that the Town and Region can take to encourage pedestrian and transit friendly development in the Branchville Station area. The Town seeks to ensure that future development will provide an environment that is supportive of local residents, property owners, businesses, and commuters. The Upper Washington Development provides 35 units of affordable housing and 2,600 square feet of community-oriented commercial space across two buildings in the Four Corners section of Dorchester, Massachusetts—a primarily African-American, Caribbean, and Puerto Rican neighborhood. Over recent years, the area has seen civic action and physical investments to thwart a previous culture of disinvestment and urban decline that plagued it. 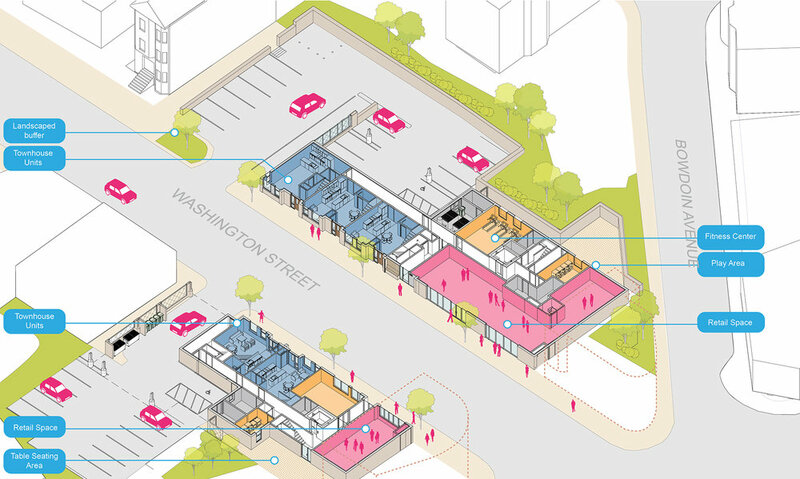 The Upper Washington project, strategically located near the intersection of the “Four Corners,” assembled various public and privately- owned parcels in hopes of creating a sizeable development to spur further growth for the neighborhood. When central Connecticut’s new bus rapid transit system (CTfastrak) opened in 2016, two stations in West Hartford were opened in a unique section of town. The Elmwood and Flatbush stations anchor the 1.1-mile New Park Avenue corridor and present opportunity to become a catalyst for economic growth and a multimodal conduit between these transit centers and the rest of West Hartford. In its existing condition, New Park Avenue is an auto-centric corridor with industrial and suburban style retail uses, four lanes of vehicular traffic, no bicycle accommodations, and narrow sidewalks situated close to the travel lanes. To promote a balanced and integrated complete street system in accordance with the Town’s Plan of Conservation and Development, Fuss & O’Neill was contracted to evaluate improvement designs for infrastructure around the Flatbush and Elmwood CTfastrak station areas to improve inter- and intra-town pedestrian and bicycle access and connectivity. The implementation of Complete Streets measures on New Park Avenue has the potential to manage traffic volumes, reduce vehicle speeds, and create safer operations for vehicles, pedestrians, and bicyclists. An hour’s drive from New York City, Westport, CT is marked by a quaint downtown and suburban living. When the local YMCA, occupying a complex that featured the historic Bedford Building and Firehouse, decided to move from its prime location at the corner of Main Street and Route 1, the property was purchased along with an adjacent lot to create a 1.5-acre site for a 110,000-square-foot, mixed-use redevelopment. The new project, by economic necessity, would have a very dense mix of retail, office, restaurant, and residential. There was, therefore, a seminal design principle established early on. The project would have to restore the lost art of living closely together, an out-of-character aspiration for this suburban- oriented town. If successful, the project would achieve a uniqueness both memorable and transformative. Young professionals and families are leaving Cape Cod because they cannot afford the housing costs and their professional ambitions are not matched by opportunity. The Side Hustle House addresses both concerns with a comfortable and efficient house plan that adapts to life’s changes while supporting methods of generating income on the side. Mixed use extension of the downtown that includes a range of commercial, residential, and public amenity uses fronting on a new linear waterfront public park. Through a series of public meetings, the design team established the general site layout working back from the water’s edge. A linear public park is proposed along the waterfront that connects an existing downtown park to the south to a regional recreational park area to the east, while also preserving the most environmentally sensitive areas and giving the public access to the river. The Destination 2040 long-range transportation plan takes a new approach to transportation planning in the State of Maine. Lead by the Portland Area Transportation System, the MPO for the region, Destination 2040 sets a new policy direction for 18 communities, 7 public transportation providers, public and private transportation organizations, and citizens. 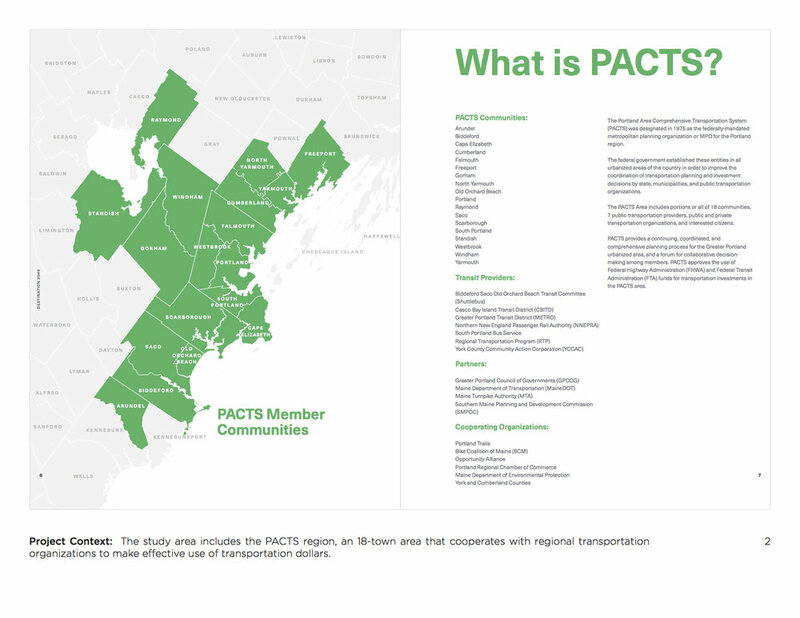 As one of the most densely populated areas of the state, the PACTS region is often times at the forefront of new policy directions, making this plan of statewide importance. The Point Neighborhood is the densest neighborhood in the City of Salem. Over the past decades, while $1billion in investment has transformed downtown Salem into a hip hub of the North Shore, the Point had seen virtually no investment, public or private, to speak of. 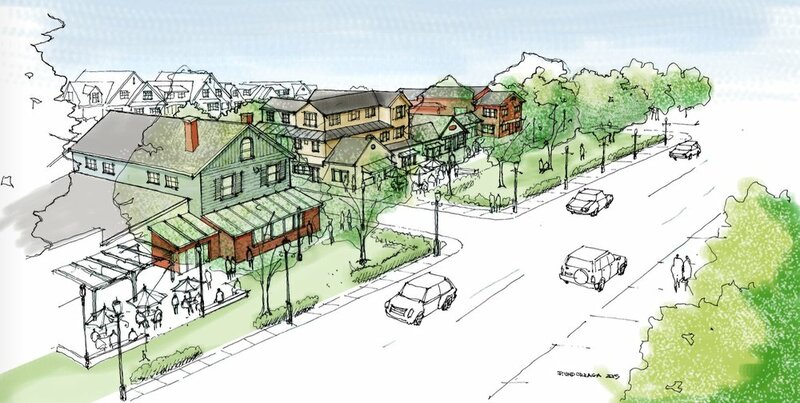 As a result, in 2013, an interdisciplinary team comprised of the City of Salem, North Shore CDC, the Point Neighborhood Association and over 300 residents worked together to create an American Planning Association-award winning planning document called “The Point Neighborhood Vision and Action Plan “(PNVAP). Since its implementation, the Point Neighborhood has witnessed over $45 million in public and private investment, including $250,000 in public art. In addition, other $44 million are under way to be completed in 2020. In 2017, the area was positively mentioned in local and international acclaimed news media such as The Boston Globe, Juxtapoz Magazine, New England Design Magazine, the Peabody-Essex Museum member newsletter, and more. Somerville’s Winter Hill Neighborhood needed a vision that would guide investment for both public and private projects. Our team created an engaging public process that mimicked our methods for Somerville’s city-wide zoning overhaul, of which the Winter Hill Neighborhood Plan is a part of. The process is an iterative method that allowed the expertise of city residents, staff, and team of urban designers to shine in a collaborative way, guided by the present and future physical realities of the site. The Neighborhood Plan aimed to provide smart planning and design that could be utilized to spur development and improvements according to the City of Somerville’s vision and goals. For over 20 years, a staple of Providence culture has been the yearly series of bonfires on three rivers in the city’s downtown that is presented by WaterFire. While WaterFire was a primary driving force behind Providence’s renaissance, this on-going non-profit arts installation was in need of a permanent home for its operations. Consistent with both its creative and giving-back mentality, the organization selected to restore a former rubber factory mill building in an underserved neighborhood. Completed in 2017, the 37,000-square- foot multi-use WaterFire Arts Center gives WaterFire Providence a permanent home and exciting new arts and culture venue, while preserving a historic building and helping to revitalize the Valley neighborhood of Providence. The Downtown Derby Vision Plan illustrates a vision for the 19.5 acre parcel south of Main Street in Downtown Derby (South Point District). The Plan is supported by zoning regulations to guide its successful implementation and is reflective of the hopes and aspirations of the citizens of Derby. The work was produced before, during, and subsequently to the Downtown Now! charrette (an intensive and collaborative planning workshop) conducted in Derby, Connecticut, November 14-18, 2016. In advance of the charrette, the team conducted rigorous technical analyses to help clearly define the opportunities and constraints the site presented. For generations the Malden River was an industrial waterway walled-off to public use. The Malden River Greenway lays out a vision that will transform the river, creating a world-class park system running through the cities of Everett, Malden, and Medford, Massachusetts. The plan builds from ideas generated in Boston’s most innovative and inclusive public engagement strategy—the “question campaign,” which created direct input from over 5,000 unique members of the Boston region. Questions were collected via Go Boston 2030’s website and a Question Truck that traveled throughout all of Boston’s many, diverse neighborhoods—with materials translated for their respective communities. Questions were organized by theme and reviewed by community and interagency partners to select “priority questions” to be displayed at the Go Boston 2030 Visioning Lab. During the two-day open house event, more than 600 people shared their ideas about Boston’s transportation future, forming the basis for the Vision Framework. This master plan process began in 2016, coordinated with a parallel conceptual design for a proposed new rail station providing regional access as well as linkage local buses. The plan establishes a redevelopment framework for over 100 acres of underutilized land within a half-mile of the planned station. It charts an achievable course from today’s desolation to a vibrant economic engine and community heart for Bridgeport. Not just a community-based vision and policy framework, the plan is an advocacy tool attracting critical state, Federal and private funding, and collaborative stakeholder involvement. The 6-10 Connector Master Plan is a $753 million highway downsizing project in the heart of Providence, Rhode Island. Sparked by a critical need to address the crumbling 6-10 Connector highway infrastructure, this two-phased project reprioritizes urban neighborhoods by mending the scars the “Federal Bulldozer” imposed during the Highway Era. The Project Team orchestrated a landmark campaign that included community charrettes; advocacy at the local, state, and federal levels; and the co-design of multi-modal, neighborhood-scale improvements. Construction of Phase I of the 6-10 Connector Master Plan commenced in January 2018 and is scheduled for completion in 2023. Phase II is currently under evaluation for federal funding. Located at the nexus of Boston, Cambridge and Somerville, Cambridge Crossing (formerly NorthPoint) has grown and evolved to meet the needs of not one, but three, cities for nearly 20 years. The first master plan for the site was initiated after the Eastern Cambridge Planning Study designated it as a special district in 2001. With each iteration of its master plan and each new park or building, this unique mixed-use community has become even more interesting, influential and inclusive. The project team was commissioned by a state environmental agency to research, write and publish a comprehensive guide to village development. Working with a team of state and local planners, the author led a two-year effort to research the need for villages, define legal and political barriers, and assemble detailed step-by-step guidance for how to implement village development. The results are compiled in a 130 page manual with chapters describing each aspect of the process. Including a series of case studies illustrating successful examples from across the country, the manual is designed both to inspire local planners and lead them through each step in moving towards a more sustainable pattern of future growth organized around villages.